June’s official numbers won’t be released until a few days after this article is written, so we decided to look at May’s numbers and combine some current data from MLS and a few large real estate companies in SW Florida. If you look at May’s data you’ll notice pending inventory is down 12% from last year. New pending sales are down 6.4% while inventory is up 14.1% This chart lends credence to the fact that the number of sales counts are softening. At Keller Williams our office tracks Listings Sold Volume. The board was down 13.21% in June while our office was up 25.33% That’s a differential of 38.54% I spoke with 2 large RE/MAX offices and they both said they were up about 38% and 50% respectively. I’m not sure if that was sold volume or units, but either way they’re up. So why are some offices increasing sales while others are obviously losing sales? The answer can be complicated. Perhaps the office had 1 or 2 large sales skewing the volume numbers. Perhaps they sold a chunk of homes to an investor. Or, perhaps their agents are just more tuned in to what’s going on in the market and making adjustments. 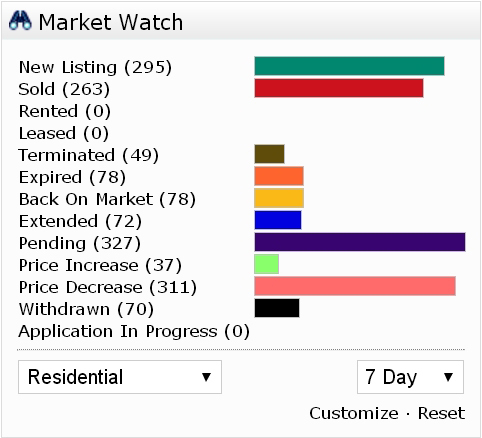 I pulled a 7 day Market Watch available through our MLS. Price decreases are outpacing new listings. 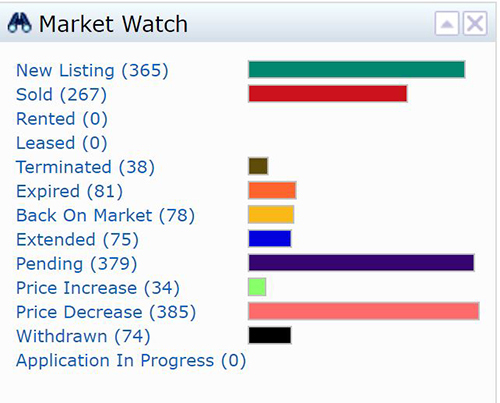 I was excited to see pending sales outpacing new listings as well, although we know not all pending sales will close. You’ll see some sellers giving up by looking at the terminated, expired, and withdrawn counts. It can be frustrating to bring a property to market and have little to no showing activity. When this happens it tells you that you’ve overshot the market. If your home is priced at market it should receive showings. If your home is way above the market, it’s not really on the market and is shunned by potential home buyers. Sometimes the sellers believe the market is at one point and the buyers believe it to be at a lower point. When this stand-off occurs, activity lessens. The sellers that want or need to sell react and make a move to find the buyers. When this occurs, a property will sell. We recently had a property go under contract. We picked a price and had lots of showings. It was priced close enough to where buyers would look at it, but not make an offer. We reduced it once and got even more showings and one low-ball offer. We reduced it a second time and it sold, for much higher than the low-ball offer. The home initially was priced right where it should be based upon past sales. However, the market rarely stands still. In that price range we noticed a shift in the market. If this seller would have stayed at yesterday’s prices, the home could still be on the market. You never want to get caught chasing the market down. You want to get ahead of it. People read that prices are up, and they are up 4.7% in May versus last year. That doesn’t tell the whole story. That is median price, and some price ranges are increasing while some are decreasing. Knowing where your home fits is crucial. Sure, you can interview 5 agents and pick the one who says the highest price. But have you done yourself any favors? If your home sits on the market and 6 months later you’re shaking your head because it hasn’t sold, are you going to be happy you selected the agent with the highest price? We’d suggest interviewing agents who know the market, will be brutally honest in regards to price, and markets the home in a way to reach the entire market. If you do that, you will have success. If you don’t, you can find that agent the 2nd time around and hope that prices haven’t declined further. If it was priced right the first time, it should have sold. Keep in mind, just because you overprice it today doesn’t mean the market can’t fall further. If it does, you’ll just be chasing the market down. Always call the Ellis Team at Keller Williams, we’ll help you get your home sold now! 239-489-4042 Find your dream home now!